I love his work more, each time I look at it and have been waiting for an opportunity to photograph something inspired by his work. Reflections are the obvious choice for me as I always enjoy those on the river and have fun picking them out for a composition. 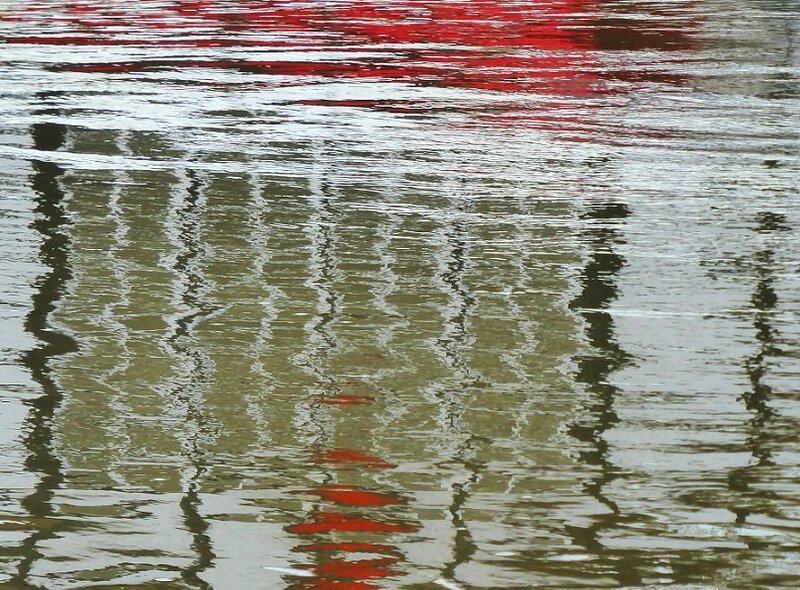 Sadly, a trip to Venice is not on the cards, so in response to Ernst Haas Bridge in Venice reflection, all I can offer is Boathouse in Bedford. Best I could find for today. Yes, I have the same, I keep going back to his website and look at his work. Love your alliteration and interpretation! love that red amongst the squiggles, nicely done. Absolutely gorgeous, I LOVE this shot. fav. Lovely, your reflections always are. Such a restful picture. The ripples have softened everything and I do love the pops of red Helen.